Heady with cinnamon, this easy chicken dish comes together in no time flat. Inwardly, we cringe, yet outwardly remain calm as we explain that just because we work from home does not mean we have all the time in the world at our disposal. Oh, sure, there is the luxury of being able to arrange our schedules to make it to the gym for a quick workout now and then or to pick up kids from school regularly. But the notion that we bask in long lunches without a care in the world is pure fantasy. More often than not, we’re gulping down a carton of yogurt in-between interviews and conference calls or deep in thought at the computer, trying to put the finishing touches on a story before diving into another one to write. So just because our kitchen is steps away, we approach cooking just like anyone else who works outside the home: We save the ambitious recipes for the weekend, and live for fast and easy during the week. 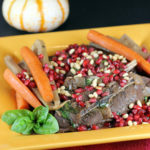 The recipe is from the new cookbook, “Turkish Delights” (Kyle), of which I received a review copy, by John Gregory-Smith, a travel writer and cookbook author who splits his time between the United States and the United Kingdom. 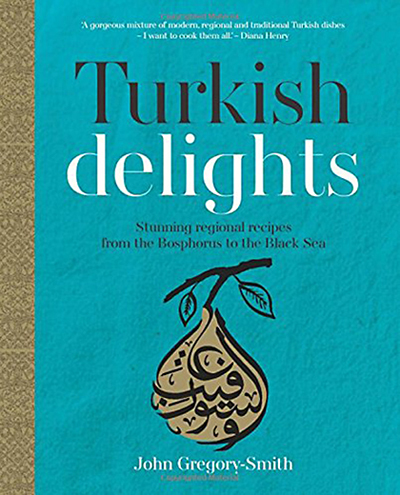 It includes more than 100 recipes for regional Turkish cuisine, which takes influences from Greece, Bulgaria, Syria, Iraq, and Georgia. Choose from meze, kebabs, salads, desserts and breakfast recipes to satiate your culinary wanderlust. This particular dish is about as easy to put together as it is to make pasta with a sauce or a stir-fry with rice. But it perks up the palate with unexpected warmth of cinnamon. Bite-size pieces of chicken — I used thighs rather than breasts, as called for — get cooked with apricots, lemon juice, honey, cinnamon, and almonds, before spooned over a bed of herby orzo. 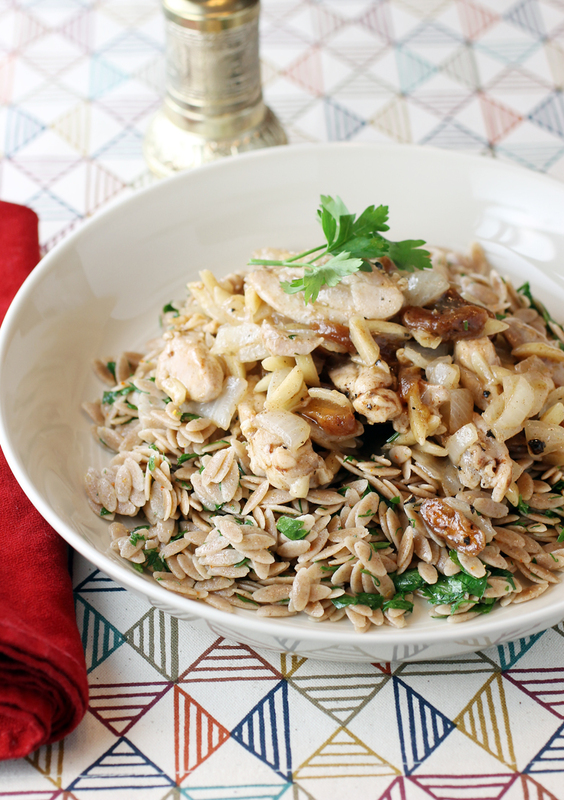 I used whole farro orzo, which is darker brown in color and has more grain flavor. I also created a slurry by first mixing the hot water and cornstarch together before adding it to the pan of chicken, rather than adding them separately, because I think the sauce thickens more cohesively that way. In no time flat, you end up with a unique chicken dish that’s fragrant, sweetly earthy and citrusy with loads of crunch and texture. I might not have time to spare most weekdays. But I can definitely make this any day of the week. So can you. A melange of textures in every bite. Cook the orzo in a pan of boiling water according to the package instructions. Drain and return to the pan. Add the butter and a generous pinch of salt. Stir in the herbs and Turkish pepper flakes. Heat the oil in a large pan over high heat and add the chicken. Fry for 2 to 3 minutes to sear the meat. Add the onion and almonds and fry for an additional 3 to 4 minutes until golden. Reduce the heat to medium and add the apricots, lemon juice, honey, cinnamon, black pepper, and a generous pinch of salt. In a small cup, stir together the boiling water and the cornstarch, then add to the pan. 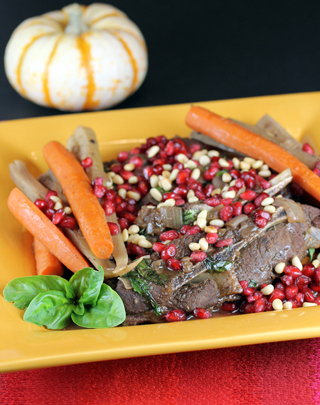 Continue to cook for 1 to 2 minutes, mixing everything together, until thickened. 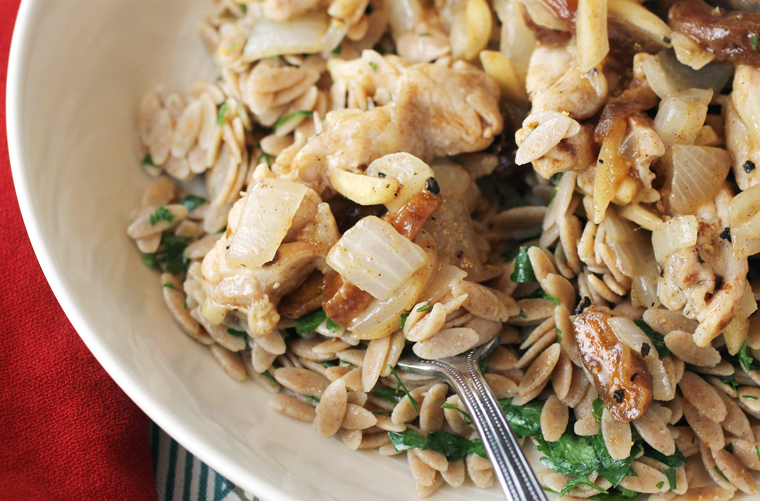 Serve immediately with the orzo.